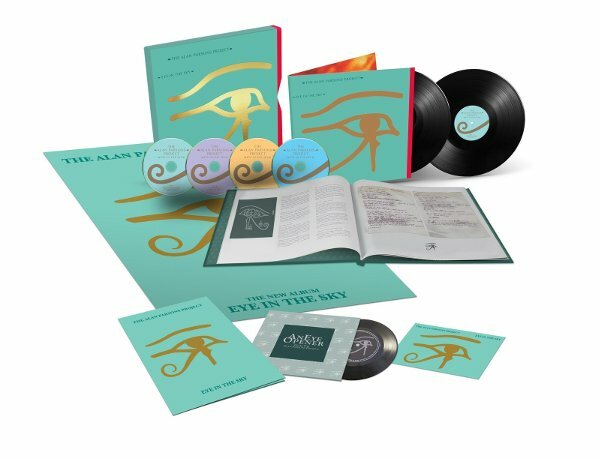 Legacy Recordings is expanding the Alan Parsons Project's 1982 album Eye in the Sky in celebration of its 35th anniversary of release. The new edition will be out on November 17. A multi-layered masterpiece, Eye in the Sky is the Alan Parsons Project's sixth studio album written by Eric Woolfson (who passed December 2, 2009) and Alan Parsons. A conceptual musical meditation on a variety of belief systems--the album's title refers to casino surveillance, earth-circling satellites and the all-seeing eye of the Egyptian God Horus--Eye in the Sky has proved both timely and timeless, a remarkably prescient view of art, religion, politics and culture for the 21st century. The new edition includes three CDs and one DVD with the original album, bonus tracks, a disk of Eric Woolfson's songwriting diaries and 5.1 surround sound and stereo HD versions of the album. Two vinyl LPs include the album pressed at 45 RPM for supreme sound. Also in the package are a replica flexi-disc of the album promo and a 60-page hardback book featuring newly-written essays, previously unreleased images recently discovered in Eric Woolfson's personal archive and new interviews with many of the musicians who recorded the tracks on the album. Finally, there's an Eye in the Sky 1982 replica poster and postcard and a gold-foil Eye of Horus stamp on the front of the box. Sally Woolfson, the widow of Eric Woolfson, said "The songwriting diary disc is a very special element of this package. This shows Eric's private moments of creativity captured on tape as songwriting memos to himself. As he didn't read or write annotated music, this was how he developed the songs he wrote. They give a wonderful fly on the wall insight into the creative process where you can literally hear the song evolve as the ideas come out of his head. These are very precious to the family and it was extremely difficult to pick out the tracks to include in this box set from the hours and hours of material we had for this album alone. We've tried to illustrate the creative progression where a number of tracks for the same song have been included. We hope the fans will enjoy this rare insight into the birth of the songs from the Eye in the Sky album." Alan Parsons adds, "It was a wonderful experience to hear all the multitrack tape tracks from Eye In The Sky again – and for the first time in nearly 35 years, in their raw unmixed form. Hearing the various elements, performances, and moments of magic that were selected for the the final mixes of the songs was an amazing experience. Of course not everything we recorded back then is heard on the final mixes, but the included bonus tracks in the box set give an interesting insight into was not used on the final mixes. Audiophiles will be pleased to know that there is a brand new 5.1 Surround Sound mix, which I am extremely pleased with incidentally, and also a Hi Def stereo version taken from the original analog stereo master tape which was recorded simultaneously alongside the digital mix."